NADP/NADPH is a necessary cofactor in various metabolism reactions. 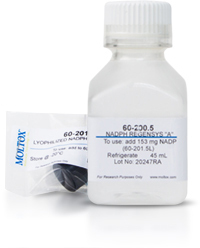 NADP is added to S9 liver extract to support the oxidase activity catalyzed by P450s, FMOs, NADPH-P450 reductase, and many other oxidase enzymes. The Moltox® NADPH Regenerating System consists of two reagents: Regensys™ A and Regensys™ B and is intended for preparation of a 4-10% S9 mix, as described by Maron and Ames1. The fill sizes refer to final volume of S9 mix per package. Our ready-to-use S9 Mix MUTAZYME™ already contains Regensys™ A and Regensys™ B.